Lungs convert available salt-water using electrolysis into clean-oxygen gas. As in much of my work, I expect the work not to only to contribute to the dialogue of our environmental problems, but I also expect it to actually to do the function that it claims to do. In this case, this sculpture makes real oxygen (and hydrogen by-product). I imagined a scary scenario where the air around us is too toxic to breath. Without the trees to help clean the air, we are faced with having to live our lives with artificial oxygen. I created glass lungs that are filled with water and attached to a power source to create oxygen. Similarly in this project, I wanted the electronics visible to demonstrate the dependence we have on technology and how it cannot substitute for the real thing. 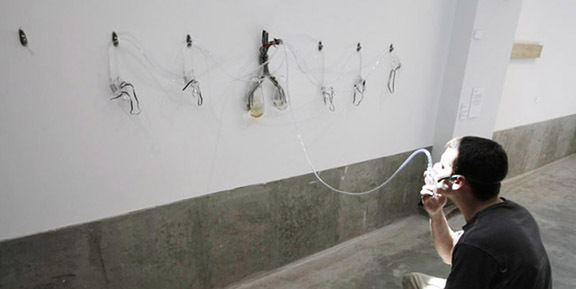 The decision to use lungs as the sculptural element was to make the connection with the human viewer more personal.